Serialized in McClure’s Magazine, May 1920 ff. From what I understand, the desert has a tendency to grow on you. Perhaps even force you to love or hate it. From the character of Dismukes it seems that Death Valley, at least, becomes addictive and will bring you back to it no matter how hard you try to run away. Death Valley, California might be said to be the main character of Zane Grey’s novel Wanderer of the Wasteland. The story of brother-love and brother-hate is a consistent theme in literature. I doubt the story of Cain and Abel was the first one told. The brothers Adam and Guerd Larey compete and disagree on the matter of the inheritance, love and lawlessness. That fight brings our main character into the land that was Zane Grey’s true love. Although Death Valley in California is a terrible place it also holds incredibly beauty. So does the Chocolate Range of California – at least the ones that could be seen in the 1880’s. When Adam Larey experiences his first sunrise, he realises what he has missed all these years. The hour came when an invisible something, like a blight, passed across the heavens, paling the blue, dimming the starlight. The intense purity of the sky sustained a dull change, then darkened. Adam welcomed the first faint gleam of light over the eastern horizon. It brightened. The wan stars faded. The mountains heightened their clearness of silhouette, and along the bold, dark outlines appeared a faint rose colour, herald of the sun. It deepened, it spread as the grey light turned pink and yellow. The shadows lifted from the river valley and it was day again. Adam is like many of Grey’s protagonists. Stuck in the desert trying to run from himself and his past Adam is forced to grow, learning to draw from new sides of himself. The days passed, with ruddy sunrises, white, glaring, solemn noons, and golden sunsets. The simplicity and violence of life on the desert passed into Adam’s being. The greatness of stalking game came to him when the Indian chief took him to the heights after bighorn sheep but it was not the hunting and killing of this wariest and finest of wild beasts, wonderful as it was, that constituted for Adam something great. It was the glory of the mountain heights. All his life he had dreamed of high places, those to which he could climb physically and those that he aspired to spiritually. Lost indeed were hopes of the latter, but of the former he had all-satisfying fulfilment. Adam dated his changed soul from the day he first conquered the heights. There, on top of the Chocolate range, his keen sight, guided by the desert eyes of the old Indian, ranged afar over the grey valleys and red ranges to the Rio Colorado, down the dim wandering line of which he gazed, to see at last Picacho, a dark, purple mass above the horizon. From the moment Adam espied this mountain he suffered a return of memory and a sleepless and eternal remorse. The terrible past came back to him: never again, he divined, to fade while life lasted. His repentance, his promise to Dismukes, his vow to himself, began there on the heights with the winds sweet and strong in his face and the dark blue of the sky over his head, and beneath the vast desert, illimitable on all sides, lonely and grand, the abode of silence. Again, it is important to remember when these novels were written and what the views of the times were. I do not find Grey’s views on women especially flattering, but they and his views of Native American and Mexicans can still be found today in the US and the rest of the world. Despite these prejudices, Grey was proud of his heritage as part Native American and it is one Native American group that teaches Adam what he needs to know to survive in the desert. That Adam feels the need to rescue the ladies he meets from whatever awful fates they endure is understandable seen in that context. In the case of Magdalena he finds himself with quite a task at hand. Neither she nor her husband are the least bit qualified for the life they have chosen, nor do they seem interested in improving their lot. Adam falls for Magdalena, or perhaps it would be more correct to say that he falls for what he imagines she is. And so it is with each woman he falls for. But in spite of partly being a romance, Grey is unkind to Adam’s love life. This time we do not get to meet the wonderful mustangs Grey usually adds to his stories. 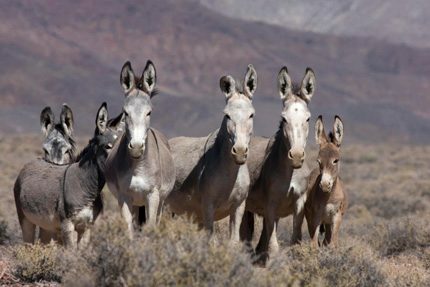 Instead we meet some pretty awesome burros. Talk about hardy little animals with wills of their own. I think that is one thing I really like about horses, mules and donkeys – you need to be able to talk to them if you want them to help you out. Otherwise you are going to have a fight on your hands. We get plenty of action and adventure. And sadness. Plenty of lives and dreams are unfulfilled in Wanderer of the Wasteland.